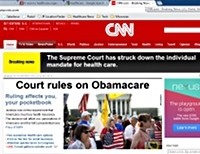 The U.S. Supreme Court today ruled in favor of the Affordable Care Act and the contentious individual mandate, finding the latter constitutional if viewed as a tax. The decision allows the government to continue rolling out the healthcare law, scheduled to go into full effect in 2014, and prevents insurance companies from denying coverage for pre-existing conditions. Conservative Chief Justice John Roberts sided with the high court’s liberal justices in voting to preserve the landmark healthcare law, known fully as the Patient Protection and Affordable Care Act (PPACA) but informally referred to as “Obamacare.” In the majority opinion, Roberts noted that, while the individual mandate (which requires Americans to have health insurance coverage or pay a fine) is not covered by Congress’ authority to regulate interstate commerce as the government had argued primarily, the fine can be viewed as a tax, which is within Congress’ constitutional powers to levy. The four conservative dissenting justices would have struck down the entire ACA and not just the mandate. The controversial law, still opposed by many lawmakers who will attempt to repeal it legislatively, is considered the signature accomplishment of President Barack Obama, who called the decision “a victory for people all over this country whose lives will be more secure because of this law.” Potential benefits of the ACA touted by the administration include expanding healthcare coverage to more than 30 million currently uninsured Americans, requiring businesses with more than fifty employees to offer coverage to them, lowering drug costs for senior citizens, covering young adults up to the age of 26 under their parents’ insurance plans, and providing free preventative care in some cases. Americans without insurance who currently head to a hospital’s emergency room rather than a doctor’s office for non-critical issues may now eschew the costly and often unnecessary ER visit for regular doctor appointments. Shares of hospital chains rose after the ruling, as did shares of insurance companies that specialize in Medicaid. The effective implementation and use of an Electronic Health Records (EHR) system like Medisoft Clinical, Lytec MD, or Allscripts MyWay helps to drive down costs and make healthcare more affordable. Please contact a healthcare technology consultant at Microwize Technology for more information.